Using treadmill or running machine, for either physical activity or a cardio workout, is very popular. Just go to any gym and you will see many of them occupied. Walking, jogging, or running are one of the best cardio exercises. They improve both heart, body, and brain health. This is because they increase your breathing rate, heart rate, blood flow throughout the body and the brain and cause you to sweat. Walking, jogging, and running are outdoor activities. But that is not always possible. Using treadmill, these cardio activities take place in the comfort of an indoor environment, be it the home or the gym. 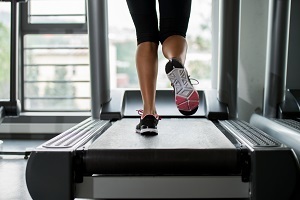 Moreover, walking, jogging, or running on a treadmill lowers the risk of injury. And, it causes less stress on your joints than running on a hard surface such as asphalt or concrete. Furthermore, it helps you avoid twisting an ankle, tripping, or other injuries from running on uneven surfaces. Also, if you’re running at night, these running machines save you from having to run in the dark. And, you are not at the mercy of the elements, such as rain, snow, and heat. Finally, you don’t have to look out for road hazards. Most noteworthy, depending on your need, you have a choice of several types. First of all, the entry level treadmill, is used in the home. And, it has a small motor. However, it is not for heavy people. Moreover, it’s good for walking or jogging. Secondly, there is the manual treadmill powered by the walker, jogger, or runner. Next there is the folding treadmill that is folded and rolled away to storage. Then there is the walking treadmill. Furthermore, this running machine is budget friendly, comfortable and, everything is within arm’s length of the walker. Also, there is the running treadmill that can accommodate tall runners, uses a powerful motor, and lots of features. Next there is the compact treadmill, which is small in size, usually foldable and rolls into storage. Furthermore, the heavy commercial treadmill powered by powerful motors provides a smooth running platform. In addition, there is the office treadmill, which usually has a desk at the front end of the running machine. Furthermore, the desk has a place for a laptop, keyboard, mouse, etc. Moreover, the person using this running machine walks while doing work on the computer. Finally, there is the hybrid treadmill, like the treadclimber, which adds the benefits of an elliptical machine. Most noteworthy, in 2014, there were over 24,000 injuries that required hospital emergency room visits. And, distractions were the main cause of these accidents. In addition, click here for infographic illustrating how to safely use these running machines. In conclusion, using treadmill is very popular among all age groups while providing significant cardio benefits to those using it.